A Washington college professor is shaking up the world of education and helping students get better grades like never before. Using a progressive teaching style that breaks down barriers, Ellen Bremen, a tenured professor of Communication Studies at Highline Community College just outside of Seattle, Washington is teaching students things that no one ever dreamed of telling students before. Students wonder, "How can I get better grades?" Many students go all the way through college and never figure out that what they really need to learn is how to effectively and professionally communicate with professors, people who work in the institutions, and other students. In reality, most professors feel frustrated by the way students bungle communication over class-related issues. Sadly, those same professors won’t take the time or believe it is their responsibility to enlighten students about how the interaction could have been improved. On day ONE after you've gone over the syllabus and any introductory material, go right up to the professor and say, "I am trying to get an A (or B, C, whatever) in this class. Can I meet with you to create a plan?" During the meeting: You say "Do you review work in advance? How early would you like me to submit that? How would you like me to turn it in? Can I deliver it in person? Or by e-mail? Too few students even check their grades during the term! What if your professor accidentally transposed a number or, worse, entered a zero? What should students never say? "I really NEEDED to get a 4.0 in this class!"... in week 10 (Then you should have had a grade goal conversation in week 1 when you and your prof could have actually hatched a plan!). How do students handle the two peskiest, but common, everyday college issues? Late work and absences! Approach your prof with a proactive proposal: "Professor, I've had a situation arise that caused me to be late with my work/absent. This was unavoidable. I reviewed the syllabus and understand that I will face __________ penalty. I've figured out how this affects my standing in the class. I see that you covered Chapter 6 and 7, and I will be responsible for those on my own. I will have my assignment to you on X date. Are you comfortable with this timeline/plan?" Never give an excuse: The reasons don't matter. Your prof cares about you, but time is short and needs to solve your problem. Never ask your prof to go over everything you missed. You wouldn't ask your clergy to redo a sermon for you in your living room, right? Don't force your prof to be reactive. You have a far better chance for a creative solution and for latitude if you are proactive! "Did I miss anything important today?” Hours of research and planning goes into prepping for a class session. Even days that may seem "boring" or uneventful are taken seriously by your prof.
"Professor, I have to miss next Thursday and I apologize for that. I've tried to keep my absences to a minimum (only say this if it's true). I looked at the schedule and I see you're covering Chapter 11 that night. I know we're taking our quiz a few days later. I believe I'll be able to stay on track. Is there anything I'm not thinking about that may be covered? I'd be glad to do the research on my own or ask a classmate to help me with notes." “Will this be on the test?” Look at the title of your course. There is bound to be material that will be on a test, and some that won't be on a test. But, really, if you walked in on the first day of class and your prof said, "Okay, class, everything you need to know is on page 4, 8, 12, 15, 16-19, 22, 24, 30, 35-42, and review all of the chapters in section 3 of your text. You can leave now," would you really be happy? Believe it or not, you wouldn't feel like you were learning very much.... and you'd feel short-changed in your education. Instead, say this: "Professor, I see we have a couple of major tests coming up. I'll be working on my own study guides, but I'm also wondering if you'll be giving us a study guide or offering a review session in class?" -add a question-and-answer period after each section? -submit anonymous questions before class that you can answer during class? -do activities related to the material? -assign a section to students and allowing them to present the material? And there’s much more. 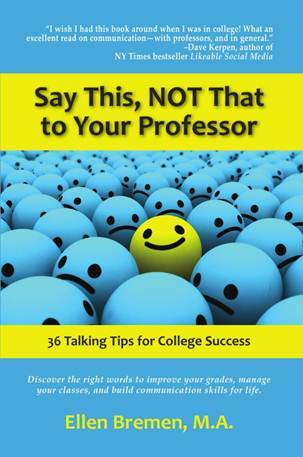 Say This, NOT That to Your Professor is the first book that is totally devoted to the student-prof dynamic. Students work with professors every single day and yet there is no readily available handbook available anywhere that takes the mystery out of how to behave so you achieve success on campus. This book tells students exactly the words to say in person. There is no alternative that is effective. The students can't text it in, Facebook it in, or even phone it in with professors. Like it or not, most of the essential communication that leads to success in college has to be done face-to-face. A 14-year classroom veteran, Ellen Bremen is tenured faculty in the Communication Studies department at Highline Community College. 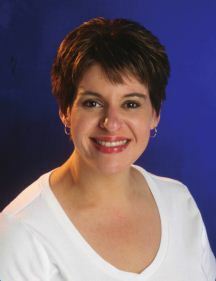 She has previously taught at Darton College, University of Nevada Las Vegas, and the College of Southern Nevada. Ellen has received national recognition for teaching innovation by the Sloan-Consortium (2011), the National Institute for Staff and Organizational Development and the National Council of Instructional Administrators (2003). She received degrees in Post-Secondary Education and Communication. Ellen blogs as The Chatty Professor. As someone that has worked in higher education for some time, I can honestly say that this book does offer some great insights into what you should and should not do when it comes to interacting with your professors. Some of the points are common sense (if you have attended college in the past), but there are also some real hidden gems in the book as well which made me say, yes, this author really know what she is talking about. What I loved most about the book was that the author is a professor and she is sharing her own experiences in the classroom with the reader, and this type of experience is so valuable for all readers to know as it is this experience that makes the book as valuable as it is. The book has a light tone, but it is very heavy in details and information and is truly a resource that any current college student or soon-to-be college student should read! Aurora World Announces Crinkle Friends “Brights”! CD Review - MercyMe's "The Hurt and The Healer"
FINDING NEMO - Photo & 3D Theatrical Trailer!!! Let ACTIVATE help you get "Summer Ready"
Book Review - Faster! Faster! Disney/Pixar BRAVE - Hilarious "Kilt" Video!